Chances are you can already pinpoint your best work hours just by how you describe your energy patterns — are you a morning person or a night person? Of course, those are comparative signs; no matter what hour of the day you sit down to tackle a project that intimidates you, you're more likely to feel dread than expectation. But you'll notice a difference in your overall demeanor and approach to work during your best work hours. Unless you arrange your work tasks to line up with your best work hours, you might trudge along, wasting your best working time on routine tasks, meetings, or chores. Figure out your natural best work time, then incorporate a few tactics to make the most of it. 1. 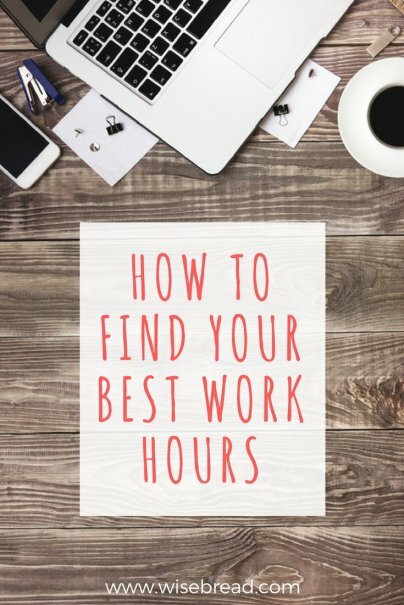 Map out your best to worst work hours. If you already have a good idea of when you're at your best (and worst), then write it down to get an idea of the flow of your day. If you're not quite sure, use the Daily Productivity Heatmap developed by Charlie Gilkey. This free download is a map of a 24-hour cycle with a color code. You fill in a color for each hour to identify where you are on a productivity scale. Identify the projects/tasks that need your full focus (creative work) and those that don't (routine tasks). Blocking out lower-productivity time for those routine tasks, errands, meetings, etc. 4. Guard your best work hours ferociously. Remember that there are cycles. You can't function at maximum productivity all the time, but you can make the most of those times when you are at your maximum productivity levels. Don't let them be stolen away by obligations, interruptions, or your own lack of planning. It's worth a little effort to figure out and arrange your schedule to use your best work hours. You'll get more done, you'll do it faster, you'll produce work of higher quality, and you'll be more creative. You'll also enjoy the work you're doing more when you are at your best. When you're able to plow through projects and quickly come up with creative solutions, work becomes less like work and more like fun. And who couldn't use a little more fun? Agreed. For me, it is between 5-7am. Not sure how I became a morning person, but I am incredibly focused and able to get more done in those two hours of the day than in the next 8 combined....an overstatement, but not too far off. It is also not just quantity of work but quality. I am at my most creative and inventive in the early morning, and able to crank out my best work. Could not agree more. I notice that during my premium work hours 7:30AM-11:30AM and 6PM-8PM I can get done triple what I can during the rest of my day. I'm not sure why my bio-rhythms operate this way but I know that it can be a great time management tool for me. I also notice that if I force myself to get a physical workout in around 3:30 this can make a big difference to my productivity levels. I am a nightowl and really hate getting up early in the morning. It came from years of working on the nightshift in the medical field. I really do find that I function better when I go to bed around 1 a.m. in the morning and get up between 8 and 9 a.m. The downside to being a night owl is that by the time you actually get going with the nitty-gritty, business hours are half way done. My most effective hours i've found are between 8 am - 11 am and 6 pm to 9 pm at night. I really do take out all distractions and concentrate on the tasks at hand. I would say that I am a "morning person" but I am my most creative and productive at night. I'm not sure if this is really because of the time of day, or because I get a little more creative when I'm tired? It would be interesting to be able to structure my own work hours and see if I could figure out when I really am more productive.